Commuters on the inter-island seabridge have to wait about two weeks before the Galleons Passage is put to service, as the National Infrastructure Development Company (Nidco) irons out details like a new crew to replace the one that travelled trans-ocean from China, as well as its seaworthiness certificate, mandatory for all passenger vessels. The vessel docked at the Cruise Ship Complex, Port of Spain around 11 pm Monday, 145 days after departing Nansha, China. The boat docked just in time to meet the Government's latest promised estimated time of arrival of July 16. 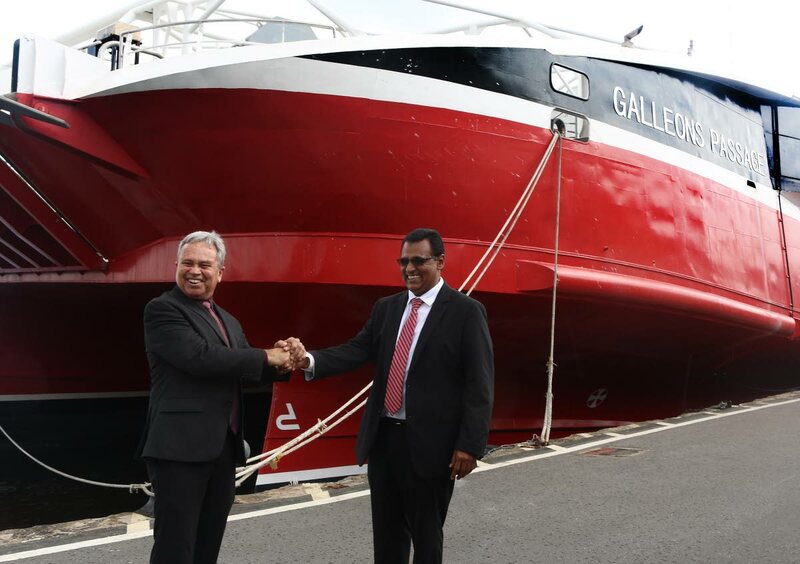 Transport Minister Rohan Sinanan and Finance Minister Colm Imbert toured the boat today along with the media and members of Nidco. Nidco will be overseeing the boat's operation, while International Maritime Services Ltd, the specialist Australian ship delivery company that brought the boat, has a one-year contract to maintain it. Minister Sinanan said during this one-year period, a tender for a three-year maintenance contract will be advertised. The "brand-new" boat, as the ministers emphasised, has space for 600 passengers below deck, 100 additional seats on the top deck, and space for 100 vehicles. The journey to is expected to last 4 and 1/2 hours, almost twice the time it took the TT Express and TT Spirit when they were in peak condition. Reply to "Galleons Passage to service seabridge in two weeks"